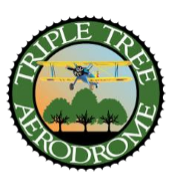 The patio is the gathering place of Fun, Fellowship, and Hospitality at the Triple Tree Aerodrome. With your support, the patio will now become the home to the Triple Tree Legacy Walk. From this vista, you can see the beautiful lake and grounds of the Triple Tree Aerodrome and what makes Triple Tree experience “like no other.” Our Legacy Walk will expand on the existing patio area. This area composed of interlocking pavers, will become a place of honor and serve as a permanent remembrance of yours or a loved one’s enjoyment at Triple Tree. Pictures are artists concepts and the final design will be like these drawings. All monies collected for this project will be held in an account solely des	gnated for this project. We will be able to move forward when we have 400 pavers ordered. Provided we have the pre-orders completed we plan to start construction in Winter 2019 with a completion date of Spring 2020.